Our chlamydia test takes around 24 hours to process and treatment is included if you test positive. We also have a new 4 hour results option for Chlamydia. Both our standard and fast options provide the highest level of accuracy. Should I Test for More than Chlamydia? If you just want to make sure that you don't have Chlamydia then a postal chlamydia test would be appropriate for you. If you have symptoms of a sexually transmitted infection then we recommend that you opt for our full home STI screen so that we are able to identify the actual cause and treat you accordingly. It is impossible to know the underlying cause of your symptoms without being tested. Do not attempt to guess which bacteria is present as many produce similar symptoms. Who can use this test? The chlamydia test is for both men and women. Men provide a urine sample for testing and women either provide a urine sample or a vaginal swab. We send you a kit in the post and you provide a urine sample or vaginal swab. You then send your sample back to our laboratory in the reply paid envelope that is included with your kit. You can post this envelope from any post box in the UK - there is no need to take it to a post office. If you are sending a sample back from outside the UK then there are specific instructions to follow. When your sample arrives at the lab it will be tested for the Chlamydia bacterium using a form of PCR called Nucleic Acid Amplification. soon as we have your results these will be posted in the secure area of our website that is accessed using your unique log in details that you will create when you register. We also offer the facility of an SMS alert if you would like this form of notification of your results. You can still log in to our website to see your full results - the SMS alert is an additional service provided completely free of charge. We are prepared to treat patients who test positive for Chlamydia using an appropriate antibiotic. This is sent to you by overnight courier after your test results are known. We are one of the few online providers of chlamydia testing services that ensures access to treatments for those who need it. Getting treated is essential, so you would be well advised to avoid any website that does not offer this a part of their service. 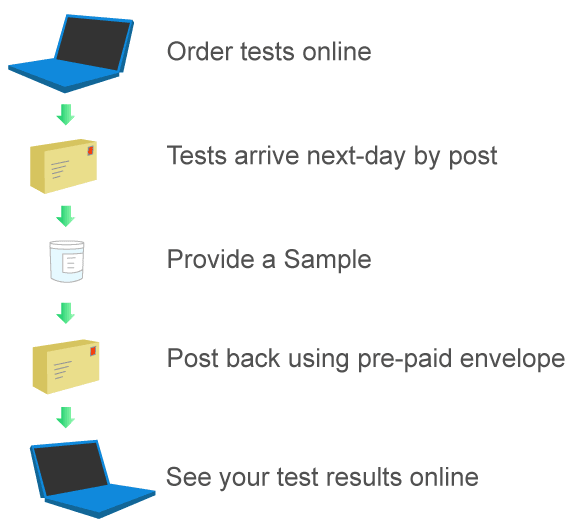 We will dispatch your testing kit to you soon after you place your order. If the order is received before 5.00pm on a week day then it will be sent the same day. We provide the option of first class mail or Royal Mail Special Delivery, which is guaranteed for the next day before 1.00 pm. Results for the Chlamydia screening test are normally available within 24 hours of the sample being returned to us. Our lab operates 24/7 so there will not be a delay if the sample is received outside normal business hours. Your medication (should you need it) will be sent that day for next day delivery. The chlamydia test offered by The STI Clinic is the quickest test with laboratory accuracy available online and it is backed by medical professionals so you will have access to advice and treatment if you get a positive result. The STI Clinic uses TDL Pathology in London. The lab is fully accredited and provides services to many private doctors in the UK as well as some specialist services to the NHS. The test that you buy online is exactly the same as the one provided by Harley Street clinics but for a fraction of the cost. How soon after a sexual event can I provide the sample? It is unlikely that a chlamydia infection will be detected in ANY test less than 2 weeks from the point that the infection was acquired. You can get tested at any point but if you are being tested after a perceived risky event and you do not wait 2 weeks and the result is negative, we will recommend a retest using a new sample. The Chlamydia test only looks for Chlamydia bacteria. If you are concerned about other STIs then we recommend one of our wider screens.